One of the most questions I get asked is “How Do I sign up for Medicare”. So I put together a checklist for you. This checklist not only answers the question, “How Do I sign up for Medicare”, but it gives you a step-by-step process on what to do and how to do it. It helps you stay on target as far as what you need to do. You can get the checklist free, by going to MedicareQuick.com/Checklist and you don't even have to give out your email address. The checklist is all yours so go ahead and download it now. And, here's a video where I go over the checklist for you. And if you have any friends who are asking the question, “How do I sign up for Medicare”, I hope you send them here too! If you'd like my help with signing up for Medicare, or choosing between Medicare Advantage or Medigap, I'm here for you. Just pick up the phone and call me at 866-445-6683. My 12 step process walks you through what you need to know in order to sign up for Medicare Parts A and B. Do you need to figure out how to pay for Medicare Part B? It's in here. 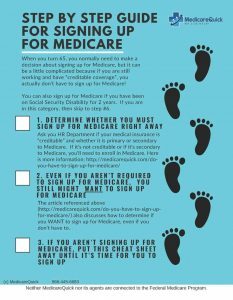 What about whether you must sign up for Medicare? It's in here. If you aren't taking Social Security payments yet, how do you pay for your Medicare? Yup, that's in here too. What will the payment be for Part B? Find out in the checklist. How do you choose a broker to help you? It's in the video. The entire 12 steps are discussed in this video, and of course, you can get the guide at http://MedicareQuick.com/checklist. And, don't forget that I'm here if you need me. Just call me at 866-445-6683.